History: On 27 September 1942 was escorting convoy RB-1. When torpedoed she was rescuing survivors of the American passenger ship New York. She was lost with all hands together with rescued survivors from the American passenger ship Boston and merchant ship SS Yorktown. The convoy was attacked by three wolf packs totalling 17 U-boats. The German submarine U-207 was sunk in the Straits of Denmark south-east of Angmassalik, Greenland, in position 63.59N, 34.48W, by depth charges from the British destroyers HMS Leamington and HMS Veteran. 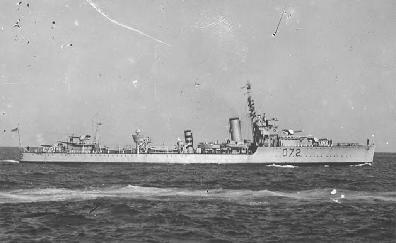 Took over the attack on U-215 from the British ASW Trawler HMS Le Tigre with depth charges and Hedgehog. U-215 was sunk but credited to Le Tigre. 6 July 1941 - ??? Sunk on 26 Sep, 1942 by U-404 (Bülow).